Amble’s share of a prestigious prize has been announced, and residents are being asked their views on what it might be spent on. The prize for winning “Best Coastal High Street of the Year” was a share of a national pot totaling £50,000 plus bespoke help for local businesses by Google’s training team. There were eight categories and an overall winner. After dividing up the prize, each category received £5,000 cash; the overall winner received £10,000. Julia Aston, director of Amble Development Trust is inviting the community who supported the Great British High Street campaign to suggest ideas for what to spend the money on. “We won because of the fantastic support of the community, and now we offer the opportunity for everyone to have their say and work with us to decide how the money is spent,” said Julia. She also invited any local business who would like to take advantage of free training by Google’s Digital Garage team, to contact her to book their place. The workshop will be held at Fourways 2 on Tuesday 15 March. Julia said she hoped that Amble will re-apply for the 2016 competition, in the hope of winning the overall prize. The Great British High Street award is a national competition run by the Department of Communities and Local Government. Once a shortlist is compiled, people can vote everyday by email. Winners are decided by a combination of voting and the judges’ decision. 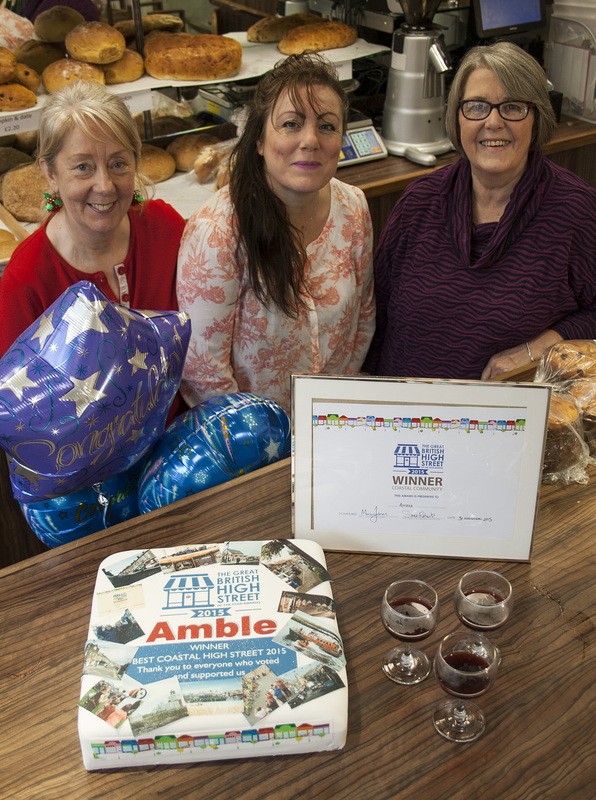 Amble came top of the Best Coastal High Street category, beating Prestatyn in Wales and Bognor Regis in Sussex by 700 votes. Voting ran for four weeks. Amble took the lead after week two, but were overtaken again towards the end. It was a nailbiting wait to find out who had actually scooped top of their category, and who was the overall winner. Julia travelled with Ann Burke, chair of Amble Business Club to Admiralty House London to hear the announcement. 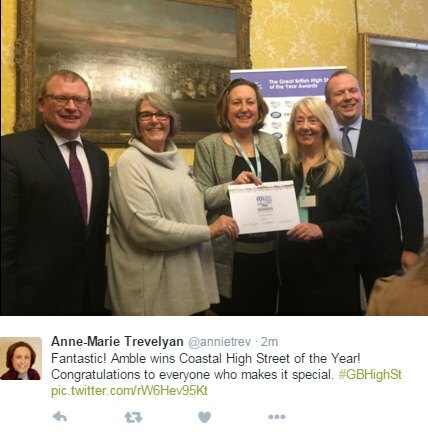 They were joined by Berwick MP Anne-Marie Trevelyan, who posted a tweet (see pic) immediately on hearing the announcement. Giving reasons why the Friendliest Port scooped first place, the judges cited how Amble’s community groups worked together, they also mentioned the independent shops, and praised the way that Queen Street and the harbour area is now much better connected, now that the Harbour Village is open. “They were so impressed with the town that one of them even returned a couple of weeks later with a fellow judge.” said Julia. The Google training is available for any local business, and will take place on Tuesday 15 March. To book your free place, contact Julia.